Ivan Johnson was born in Parry Sound on March 14, 1919 to parents Peter and Matilda. Matilda Johnson was a widow with five children — John, Norm, William, Olga and Ada. The family was on a return trip to Norway when Peter Jensen met Matilda on the ship. On February 10, 1914 Peter and Matilda married in Norway and returned to Canada on the last ship before the German occupation during WW1.” Peter officially changed his name from Jensen to Johnson, feeling that it would be easier to change his name than that of his wife and her five children. 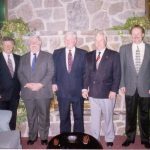 The family immigrated to Parry Sound, Ontario, Canada, where Peter and Matilda extended the family with children Peter Jr, Ted and lastly Ivan, now the youngest of eight children. The Johnson family grew up in their home at 34 Bay Street just up the road from the present day Bobby Orr Hall of Fame and Charles W. Stockey Centre for the Performing Arts. In his teen years, Ivan spent a great deal of time working with his father, Peter, in his construction business. Not only was Ivan a strapping man he was also, as many have stated, “quite a looker”. Ivan was adored by many women in the Parry Sound area and often had his looks compared to the famous Hollywood stars of his day. Ivan played minor hockey in Parry Sound for most of his childhood. He was a member of this year’s team inductee, the 1936-37 Jr. C Parry Sound Shamrocks and was named the team’s MVP. He left home at the age of 17 to further his career by playing left wing with the Junior Midland British Consols of the Ontario Hockey Association. He competed in the Georgian Bay section against such teams as the Barrie Colts, Owen Sound Grey’s and Penetanguishne Spencer Rangers. Former NHL defenseman Bert Corbeau acted as coach of Ivan’s team. Corbeau was a member of the first Montreal Canadiens team to win the Stanley Cup and later played for the Toronto Maple Leafs. While in Midland Ivan was highly recognized for his outstanding play and dedication to hockey. The Midland Free Press wrote “Ivan Johnson, elongated centre, will use his 170 pounds to good advantage on the forward line”. The Free Press also stated that “Johnson displayed exceptional bursts of speed on the forward line”. Dr. Tud Swan, club physician, informed the Midland Free Press that Ivan would be missing from the British Consols roster for two weeks, after undergoing an operation for tonsils and adenoids. It was later reported that despite needing time off to recover from surgery, Ivan finished the campaign fifth in scoring in the Georgian Bay league, piling up 23 points with 15 goals and 8 assists. While playing with the Midland British Consols Ivan had the opportunity to participate in the S.P.A series, held at Maple Leaf Gardens with the winner receiving the New York American’s Trophy. 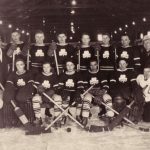 The S.P.A series featured such teams as the Waterloo Siskins, Toronto Jr. B Malboros, St. Michaels College, Toronto Lions, DeLasalle Oaklands and the Aurora Jr. B’s. While competing Ivan had a “five point night” with three goals and two assists as Midland defeated the Jr. B Malboros. In 1939 Ivan left Midland to travel to Hershey, Pennsylvania, a town known and named for its largest employer, the economically thriving company Hershey Chocolate, to play for the Hershey Cubs in the Eastern Amateur Hockey League in the newly constructed Hershey Sports Arena. In Ivan’s first game with the Cubs he scored two goals against the Atlantic City Seagulls, proving to many that he was a valuable asset to the Hershey team. The Hershey Cubs soon turned into the Hershey B’ars, sponsored by Hershey Chocolate, and ultimately became the AHL’s Hershey Bears, a team that is still in operation to this day. It was while playing with Hershey that he was given the nickname “Ching”, aptly named after NHL All Star Ivan Wilfred “Ching” Johnson who at the time played for the New York Rangers. Parry Sound’s Ivan “Ching” Johnson played with the Hershey Bears and then the Port Colborne Sailors until 1939. He then signed a professional contract with the Detroit Red Wings, playing for its farm team, the Detroit Holzbaughs, and the Windsor Spitfires in the Michigan-Ontario Hockey League. It was at this time that he met his future wife Kathleen Brogan. Kathleen was an avid speed skater, who often could be found at the Windsor Arena. They met at a Windsor Spitfires game. During this time period Ivan also became an employee of the Chrysler Corporation as a machine operator. In 1941, Ivan joined the Canadian Army reserve, serving with the Essex Reconnaissance Regiment. In 1942 he transferred to the Navy, serving the remainder of the war stationed at Montcalm, Quebec and St. Hyacinthe on the east coast as a Naval Patrolman. Bobby Bauer, and Porky Dumart of the Boston Bruins. He fought in the war from 1941 until his discharge in 1946. On January 2, 1945, Ivan married Kathleen in Windsor, ON. The couple spent their honeymoon in Parry Sound and often traveled back to Parry Sound to visit family and friends. He later returned to service in Halifax. Upon his return to Windsor, after the war, Ivan was given the opportunity to continue playing for the Detroit Red Wings organization and travel to Omaha for reconditioning. This would have been the same year that rookie, Gordie Howe, was also sent to Omaha — 1946. After much consideration Ivan decided that working for the Chrysler Corporation would earn him a higher wage than playing hockey, especially as he was now the father of a newborn son, Edward. Not long after came a second son, Thomas. Ivan made sure to be spend quality time with his family and was often found tossing a puck around the back yard with Thomas. Ivan eventually went on to become a skilled tradesman and supervisor with the Chrysler Corporation until he passed away in 1972. 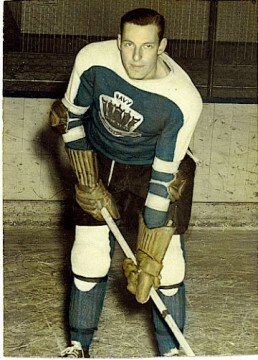 Ivan elected to play hockey semi-professionally and locally, in the International Hockey League, playing for Inaugural Turner Cup winner, the Detroit Auto Club in 1946. 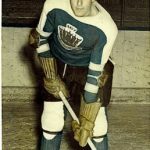 He continued to play in the International Hockey League leading his teams, the Detroit Auto Club, Windsor Ryancretes, Windsor Staffords and Akron Stars as their top scorer and All Star until 1949. After retiring as a player, Ivan continued his involvement in hockey for many years by coaching for the Windsor Lion’s Club. It has been said that Ivan was coveted by seven professional teams all at one time. The Toronto Maple Leafs wanted him when they dealt for the famous Harry Watson but Jack Adams, former coach of the Detroit Red Wings and namesake for the Jack Adams NHL Trophy, would not trade him. Ivan would have gone on to play for the NHL had this deal been processed. Those like Elwood Robinson who had the opportunity to see Ivan play compared him to the “Big M” — Frank Mahovlich of the Toronto Maple Leafs — only better. Jim Taylor compared him to the great Jean Beliveau of the Montreal Canadiens. 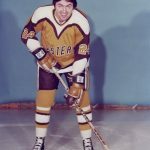 2004 Inductee Alex Eager was going to nominate Ivan as an inductee for the Bobby Orr Hall of Fame, but passed away before doing so. 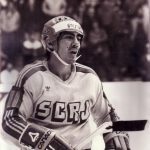 Alex had been quoted as saying “Ivan was one of the top two players to ever come from Parry Sound”. The other of course was Bobby Orr. In the year 2004 Doug Orr, father of Bobby Orr, nominated Ivan Johnson. Sadly Doug passed away before we were able to tape his comments for Ivan’s video tribute. Doug often visited the Bobby Orr Hall of Fame and was very excited to be involved with Ivan’s induction. In discussing why he nominated Ivan he said “When I was growing up all I wanted to do was play hockey like Ivan Johnson” and “Ivan Johnson was a hell of a player, and more than deserving of being inducted”. Unfortunately Ivan was born at the wrong time, with World War II breaking during the prime of his career. Today he may have been an NHL superstar. and grandchildren Kristine, Thomas Jr. and Heather. Kristine was married to Devin Malott in 2004 and gave birth to Ivan’s first great grandson Hunter in 2006. Ivan’s son Edward passed away on December 23, 1993. Ivan’s outstanding achievements and passion for the sport of hockey make him more than worthy of taking his rightful place as a 2006-2007 inductee into the Bobby Orr Hall of Fame.